Taylor and I had the same number of catches in the first Bears/Lions game last season. And for 3 straight years the lions swept the packers! Swept the Lions this year, but got swept 4 of the last 5. Bear’s Down! Easy Taylor. The Bears need to string together multiple winning seasons before you can talk like that. Correction, it’s never good to talk like that. These players just never learn that Twitter is a place where they can only get themselves in trouble. As for the Bears getting an easy “W” against the Lions, if that’s the rest of his teams’ attitude, they will take a big step backward this year. You never over look any team in the NFL. Not a smart comment. Why give another team bulletin board material? The Bears, lol. Enjoy that first-place schedule this season. Never liked trash talking, especially a divisional opponent in February. Bet your bottom dollar this will come back to haunt you Gabriel if you lose the game. Some of these just can’t help themselves. Gabriel must have a lot of confidence in his teamates because nobody is game planning againt him. What a fool. I’m sure Pace or Nagy gave him an unexpected phone call. 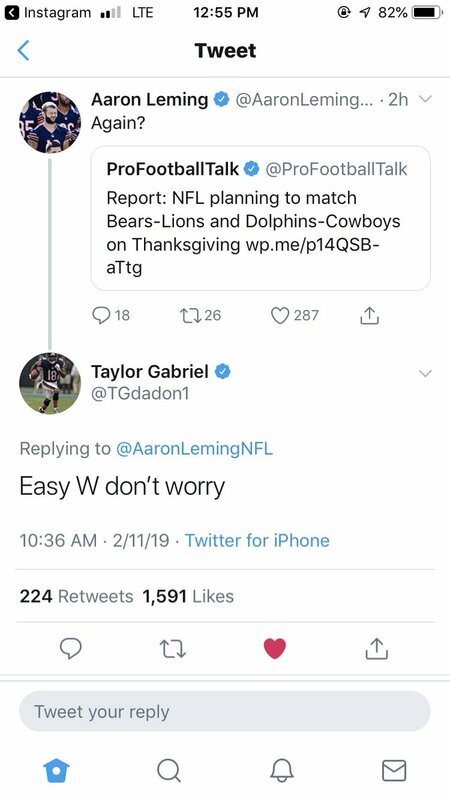 Why complicate that “easy W”, Taylor? If something is easy, there’s no need to talk about it. Now it won’t be easy, because now the Lions have 9 months to use your obnoxious bravado as motivation. Nice goin. Funny how their heads swell up after one decent season. It would have been an easy win,but now it ends up on the lions bulletin board. Not now! As a Bears fan…you haven’t really done a dang thing yet. Sure we you won the North. Are you happy with that? Stay humble and make another run next year, fool. Bears won twice last year, how many in a row did Lions win before that, 9 out of 10? As for Gabriel, he’s the 4th receiving option on his own team. His opinion is mute. Great bulletin board material for the Lions locker room….and theeen… Matt Patricia puts the headset on at kickoff. And Gabriel proves to be correct. The Bears I used to hate seem to be coming back……. So you finally beat the Lions after losing 8 in a row and now you think you’re the man? You barely squeaked out that win against their worst squad of the last 8 seasons and that was your best team of the decade. The Lions new-look defense will make Mitchell look like Mitchell again which is the equivalent of Super Bowl Goff. “And for 3 straight years the lions swept the packers! You can change your calendar from the 1950’s now, buttercup. I don’t even have the time to explain the ridiculousness of that statement. This iteration of the Bears peaked in 2018. They’ll miss the playoffs in 2019. Just poor form. I’m a Bears fan and I just don’t like this. Even if the Bears had won 12 straight against the Lions this would be bad. Not because it will cause the team to lose but, because it is bragging. Worse than that it is bragging about nothing. Not surprising though as modesty has all but disappeared as a desired trait in our modern day US. How dare he express confidence! He may look dumb if they loose. The tide has turned. Get used to loosing to the Bears, again. I’m calling it, Bears miss the playoffs next year. They got lucky the division was in a down year. I was done when the Bear’s backup (what’s his name) beat us on Thanksgiving. Belechick could’ve beat those Bears with his 2nd string.